As a gateway to the Southern Highlands, Carter County is known for its beautiful natural sites. From the Watauga River, a trophy trout stream, to the peaceful waters of Watauga Lake, along the winding Appalachian Trail to the mile high Rhododendron Gardens on Roan Mountain, there's something for everyone. Whether you're looking for a change of scenery, a summer getaway, or maybe even a new place to call home, Carter County is the place for you. Includes Cities/Towns: Elizabethton, Hampton, Watauga. Whether you are hiking in the spring, fishing or golfing in the summer, spotting brilliant leaves and mountain biking in autumn, or cross-country skiing in the winter, Carter County offers a myriad of exciting, challenging outdoors adventures. Carter County is located in the beautiful Blue Ridge Mountains of Northeast Tennessee, a haven for outdoors enthusiasts throughout the year. With four distinct seasons, visitors may select the time of year that best fits their interests. The Appalachian Trail serves as a recreational statement for the county; however, sports lovers have the advantage of a diverse selection of recreation. Camp, hike and swim at Sycamore Shoals State Park and Roan Mountain State Park. Roan Mountain is the highest point in Tennessee outside of Great Smoky Mountains National Park. Among popular out-of-doors pursuits in Carter County are boating, paddle boarding, kayaking, fishing, hiking, camping and golf. Considered the introduction to the Southern Highlands region, the county is rich with natural beauty and recreational high points. The Watauga River is the go-to waterway for trophy trout. Wind your way up the Appalachian Trail to the seemingly sky-high Rhododendron Gardens on Roan Mountain for a view you will never forget. Set sail on a summer cruise, leaving the harbor every Saturday evening from April through October. Catch the Covered Bridge Festival in June, with music, vendors and fun galore. Rent a bike and cruise the Tweetsie Trail, an easy grade hike/bike path and former railroad that meanders the beautiful East Tennessee countryside. Stroll through downtown Elizabethton, browsing interesting antique shops and spectacular restaurants. Join a group and get into the conversation! Among the possibilities are quilting, storytelling and historical groups. Bring the family to seasonal celebrations, such as the Covered Bridge Festival and the Christmas parade. The county is centrally located to many area attractions and cities such as Tri-Cities—Bristol, Johnson City, Kingsport—and two hours from Knoxville. 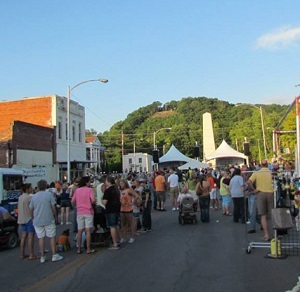 Carter County has something for everyone—shopping downtown, taking part in one of our many annual festivals and events or simply enjoying the great outdoors. Carter County is steeped with many historical and cultural opportunities. At Sycamore Shoals State Park you will find interesting facts of Carter County being the place "where Democracy began". Live outdoor concerts in Covered Bridge Park and an antique car cruise in from April to October are awaiting your enjoyment. Healthcare is always uppermost in the minds of smart, plan-ahead retirees. For injuries and illnesses of a non-life-threatening nature, visit First Assist Urgent Care, Elizabethton. For medical care that requires lab work, radiology or imaging, the Elizabethton office of Medical Care is available, with other diagnostic services on hand. Sycamore Shoals Hospital’s ER is open twenty-four hours, seven days a week, to coordinate and ensure your prompt diagnosis and efficient treatment. At Sycamore Shoals Hospital ER, you are assured of complete services. Double physician coverage shortens wait time. There is a 24-hour laboratory for emergency testing, a 24-hour radiology department for required x-rays and a 24-hour pharmacy to take care of your medication requirements. The ER is backed by Wings Air Rescue, the region's only hospital based dedicated air-transport service. At MedWorks, Sycamore Shoals Hospital has a 24-hour Occupational Medicine program that offers workers' compensation injury support. Sycamore Shoals Hospital Emergency Department serves Elizabethton, Carter County, Johnson County and South Johnson City. Jan 24.7 F° 34.5 F° 44.2 F° 3.6 "
Feb 27.0 F° 37.7 F° 48.4 F° 3.8 "
Mar 33.9 F° 45.5 F° 57.2 F° 3.9 "
Apr 41.1 F° 53.7 F° 66.3 F° 3.3 "
May 51.0 F° 62.7 F° 74.4 F° 5.1 "
Jun 59.5 F° 70.5 F° 81.4 F° 4.4 "
Jul 63.7 F° 74.3 F° 84.8 F° 4.8 "
Aug 62.1 F° 73.0 F° 83.8 F° 3.5 "
Sep 56.0 F° 67.3 F° 78.6 F° 3.0 "
Oct 43.5 F° 55.9 F° 68.3 F° 2.1 "
Nov 34.8 F° 46.4 F° 57.9 F° 3.0 "
Dec 27.5 F° 37.7 F° 47.9 F° 3.5 "
In Carter County we are blessed to experience all four seasons. Home care Senior center Visiting nurses There is an active Senior Center and multiple senior living opportunities. Volunteer opportunities are abundant in Carter County. Several community organizations including the Chamber are always looking for volunteers.